This rustic site has an excellent 9-mile driving tour, which offers access to the scenic coastal hardwoods and managed pine forests found on this portion of the WMA. Foot and bicycle traffic is welcome year-round, and numerous tram roads meander through the area (note: some gates may be locked). Vehicular access to Horse Island Rd. (north side of CR 361, across from northernmost hunter check station) is allowed only during hunting season. Songbirds like Golden-crowned Kinglet, Orange-crowned Warbler, Hermit Thrush and White-throated Sparrow occur here in winter, and Veery, Prothonotary Warbler, Swainson’s Warbler and Blue Grosbeak turn up during spring and fall migration. Bird from your canoe or kayak on the Big Bend Saltwater Paddling Trail; launch at the Dallus Creek Landing boat ramp. Swallow-tailed Kite, Barred Owl and Belted Kingfisher are possible. 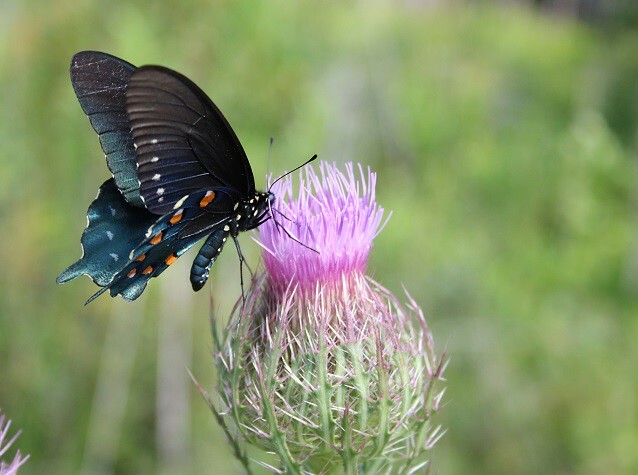 This site is superb for butterflies in late summer and fall when carpets of wildflowers decorate the landscape (click here for more information). Look for Pipevine Swallowtail, Common Wood-nymph, Southern Pearly-Eye, Appalachian Brown, Southern Broken-Dash and Twin-spot Skipper. While driving or hiking, watch for Gulf Coast Box Turtles and Gopher Tortoises crossing the road or trails. Seasonal hunting takes place at this site, please click here for details.